Hemel Town notched a far more comprehensive 3-2 victory than the scoreline suggested at Bognor Regis Town on Saturday as they took a step further towatds playoff qualification and relegated Bognor in the process. The Tudors were cruising at 3-0 until the 82nd minute when a lapse at the back allowed Bognor substitute Ollie Pearce to reduce the deficit. And with the clock ticking down, ex-Tudor Justin Amaluzor stabbed the ball home to give The Rocks a chance of a real upset. There were one or two close calls but in the end the visitors came away with an important victory which pushed them into fifth place and leaves them with the playoffs very much in their own hands. Hemel got off to the best of starts after just two minutes when Herschel Sanchez Watt was quick to close down Sami El-Abd on the edge of the Bognor area. Watt took the ball away from Bognor’s skipper and drove into the area, rounding keeper Dan Lincoln before calmly slotting the ball home. The Tudors continued to push forward and went further in front after 14 minutes when some good work down the right by Joe Howe set up a scramble in the six-yard box, the ball was only half cleared to Watt, who wasted no time in drilling it past Lincoln and two defenders on the line. Hemel’s travelling fans sat back and waited for the onslaught as Bognor looked completely out of sorts and short on confidence after these early setbacks, but it never came and too often, good build-up play was wasted. The home side started to get a foothold in the game as the half-time whistle approached but they rarely threatened Hemel keeper Laurie Walker’s goal and they went in at the break still trailing by Watt’s two goals. The second-half saw Hemel control the game for long periods but, as in the first-half, they failed to capitalise on good approach play. Finally, a third goal came when Sanchez Watt cleverly set up David Moyo who raced clear of the Rocks defence and tucked the ball away to put The Tudors far in the ascendancy. They seemed quite content to settle for this and Bognor saw a lot of the ball for the remaining minutes but even the home fans couldn’t have predicted how close the final score would end up as their side still looked short on ideas. All in all, it was an excellent result and this comes off the back of another decent performance at fellow promotion rivals Welling United on Tuesday evening were both sides cancelled each other out for a share of the spoils. 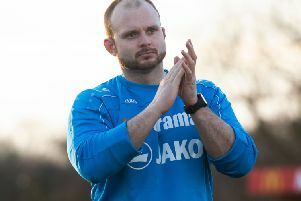 Hemel boss Dean Brennan will be pleased to have welcomed back the experience of both Tom Hamblin and Lloyd Doyley for the run-in after both had been out with long-term injuries. Wealdstone are next up at Vauxhall Road this Thursday evening and despite invariably dominating games against their local rivals, Hemel haven’t had the best of luck against The Stones over the last few years so they will be hoping this changes and they grab all three points. Hemel: Laurie Walker, Joe Howe, Kyle Connolly, Jordan Parkes, Darren Ward, Tom Hamblin (Lloyd Doyley), James Kaloczi (Scott Shulton), Michael Cain, David Moyo, Hershel Sanchez Watt (Spencer McCall). Subs not used: Will Hoskins and Danny Boness. Mitch’s man of the match: Sanchez Watt.